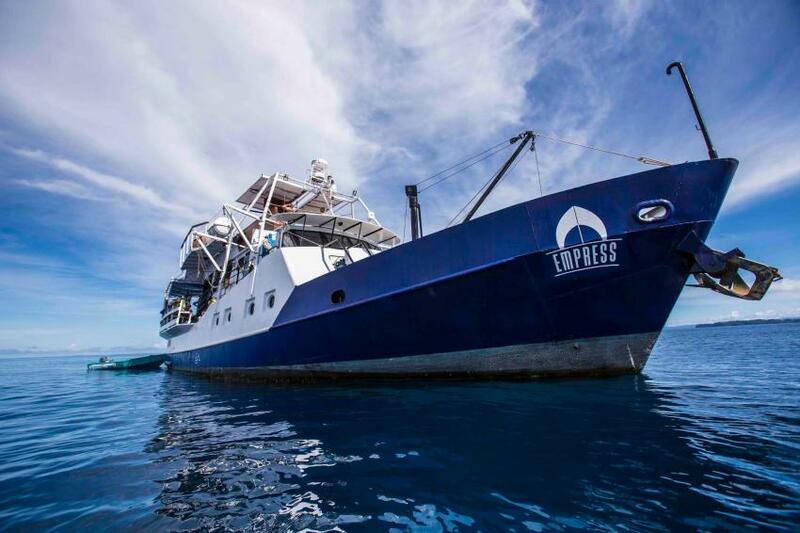 MV Empress is a strong steel liveaboard, built in total accordance with all diver's needs. Exploring wild dive sites and shipwrecks MV Empress is fitted with many unusual devices for tech diving, like an electric elevator, decompression bars and oxygen support with long hoses, full-size decompression chamber etc. The vessel is designed to work in all weather conditions and ensures safety and comfort of its guests. MV Empress can accommodate up to 10 guests in 5 cozy and comfortable cabins. There is a spacious sun deck with sun mattresses on board. Cozy indoor and outdoor salons are great places to relax between and after diving. There is huge cinema screen on board, TV, and DVD, free wifi access around all vessel based on GPRS (depends on signal strength). Empress has also another relaxing area - a shisha lounge, which is a shaded place where guests can spend their chill-out time. The boat equipped with a Nitrox membrane, so now divers with EANx certification can fill in tanks with an up to 36 % Nitrox. The safety of the guests is the highest concern of the Empress crew. Crew's members spare no efforts to ensure safety and comfort of all divers. As the only boat, Empress has autopilot combined with GPS, rudders and motors, an underwater radar and 3D side sonar, which allow determinating precisely the diver's position. For enthusiasts of tech diving, MV Empress has special route 'Tech Diving wrecks on the Java Sea'. On this itinerary divers can hope to explore wrecks of British destroyer HMS Exeter, British warship HMS Encounter, Dutch flagship De Ruyter and many others. MV Empress is fitted with all the equipment which minimizes the risk, associated with technical diving and increases the comfort of such diving. MV Empress expects not only tech divers but divers of all levels, even beginners. Explore magnificent dive sites of Komodo with its great variety of underwater landscapes. Lots of fish can be seen here, including reef sharks. Komodo is also great for macro diving. EmpressII also gives you an opportunity of visiting Raja Ampat. This destination holds the world's record of the biggest amount of coral and fish species that can be seen during the dive. Schools of fish, sharks, and rare wobbegongs can be spotted. Komodo diving is possible all year round. High season begins in April and lasts until September. Best time for technical safari is from November until January. For eastern destinations - from January until May. Perfect liveaboard experience. Safety and fun all days/night long. I can consider to make another liveaboard divebooker. The only inconvenient : I will not pay anymore surcharge for specific alimentation food. For the record, I need lactose and diary free food, and I was charged 5% more (after negociation, at start it was 10%), because I was supposed to have "differents and specific meals for" me. I did have exactly the same things than the others. So I paid more, for same... I'm disapointed only about this point. Next time I book a liveaboard with DiveBooker, I won't pay any charge for alimentation.